Welcome! The Ranger Hal Show ran on WJXT, Channel 4 in Jacksonville, Florida, from 1958 through 1969. It was a morning show for youngsters and was popular with all age groups. We now have a Facebook group, Fans of Jacksonville's Ranger Hal. That's the best way to share your own memories with other fans. The site includes actual film clips of Ranger Hal, along with the theme. Click here to go to the page! How it all started: WJXT was owned by the Washington Post. The Post also owned WTOP-TV (Channel 9) in Washington DC, where Ranger Hal started in October 1957. The show was so popular in Washington that WJXT brought the idea to Jacksonville. 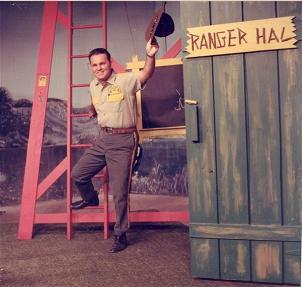 Ranger Hal caught on quickly in Jacksonville and was a strong hit for over ten years. Click here to visit a site about Washington's Ranger Hal. Provide a location for reminiscing, using a link to a Facebook page for visitor comments. Site launched April 2003. Updated February 2012. Click here to e-mail the site administrator. The e-mail address is Admin@RangerHalJax.com.